Welcome to this year's Advent Calendar from Westminster Libraries. As usual it is packed with nuggets of information, hints and tips on all things Christmassy. Each day's page will become accessible at midnight on the correct date - hope you enjoy it! If you simply can't wait to get in the mood, then here are our lists of favourite festive books for adults and great Christmas books for children. Klik hier om de adventkalender te bekijken! 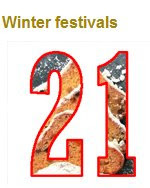 Vandaag, 21 december, gaat het over Winterfestivals.